Our collection of Gophers bowl rings and awards given to players for their participation in bowl games or other outstanding achivements. 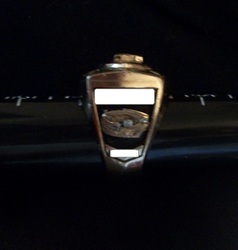 Please click on the pics to enlarge the photos. 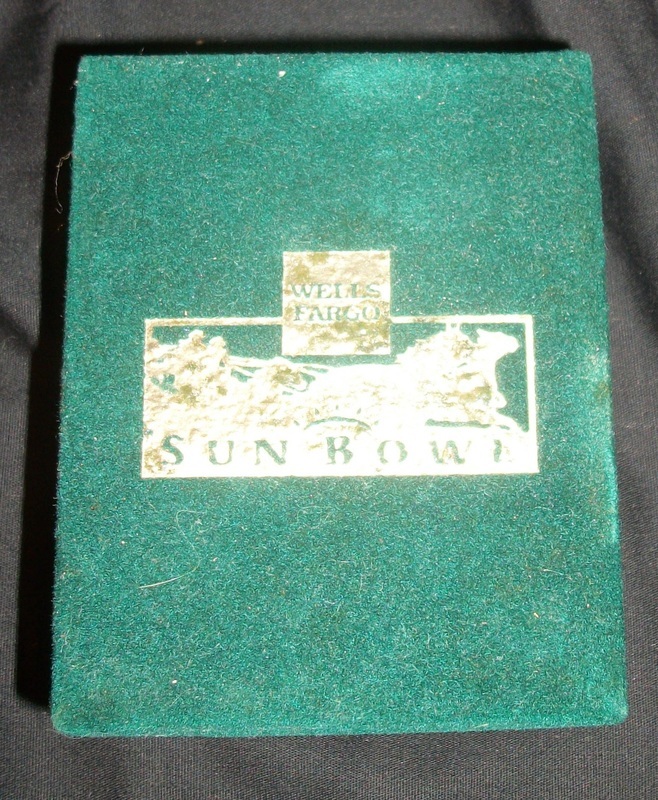 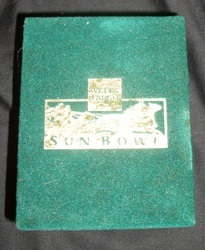 Minnesota Gophers 1960 Rose Bowl and National Championship Ring issued to OL Dan Powers. 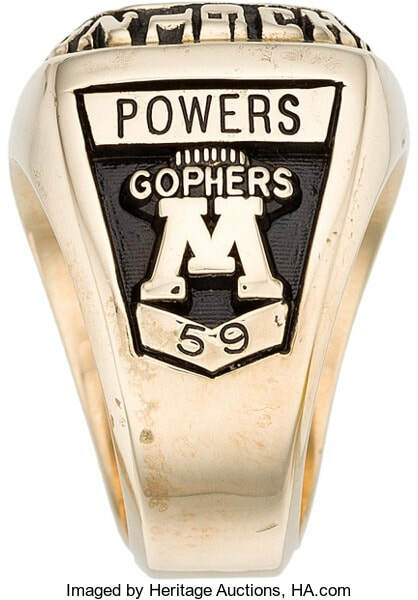 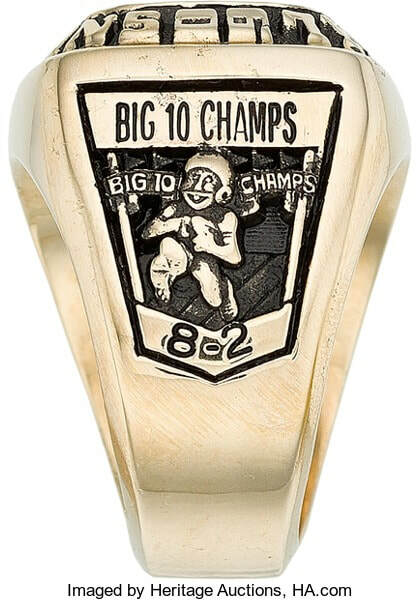 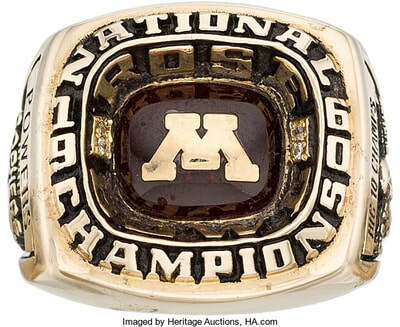 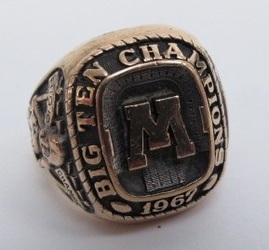 Minnesota Gophers 1967 Big Ten Championship player's ring. 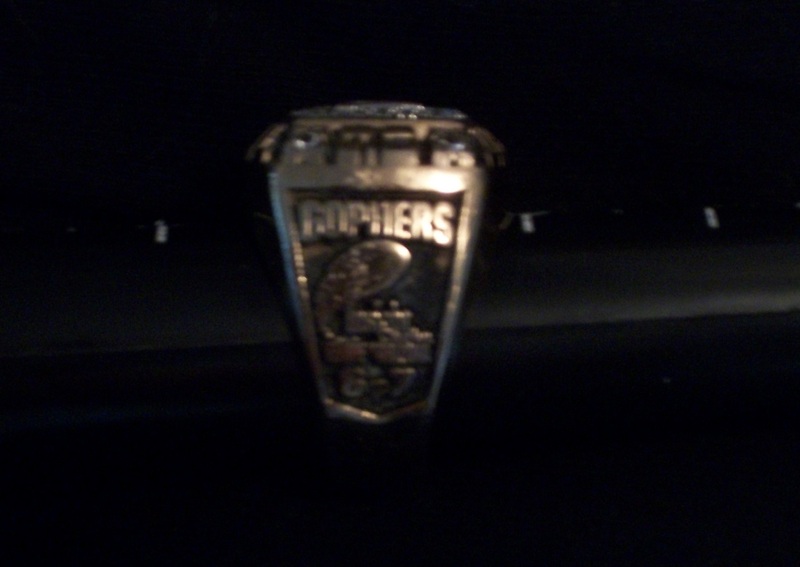 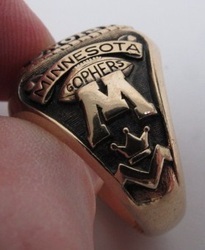 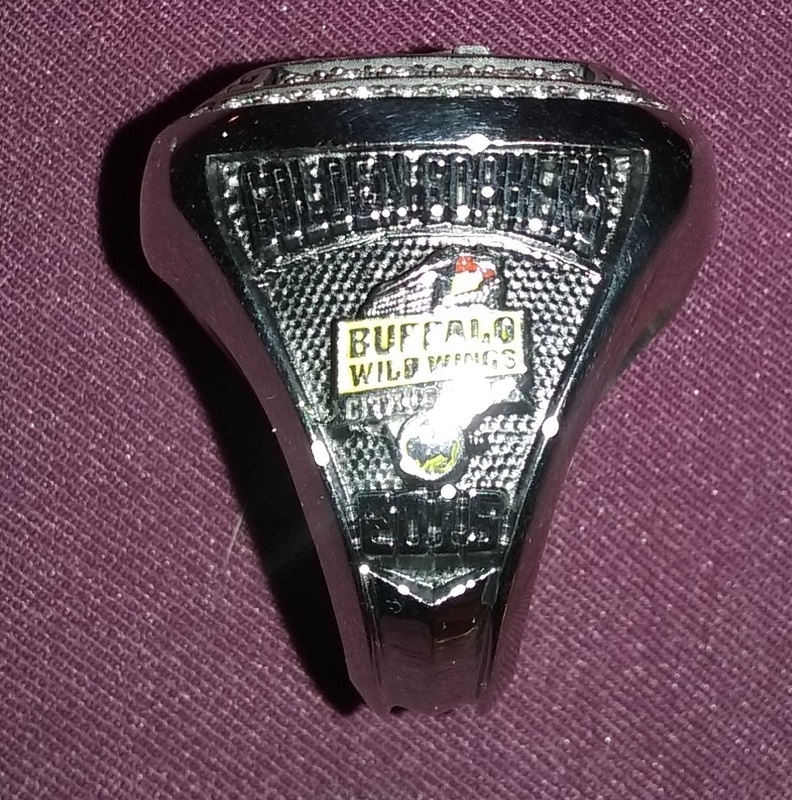 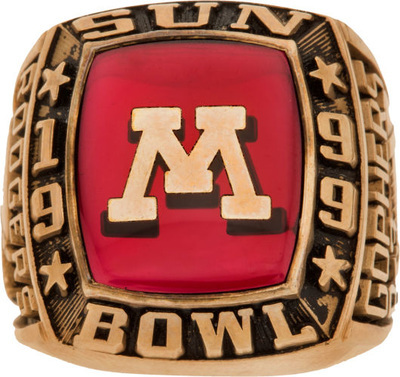 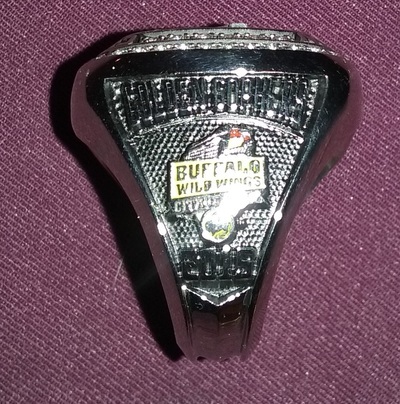 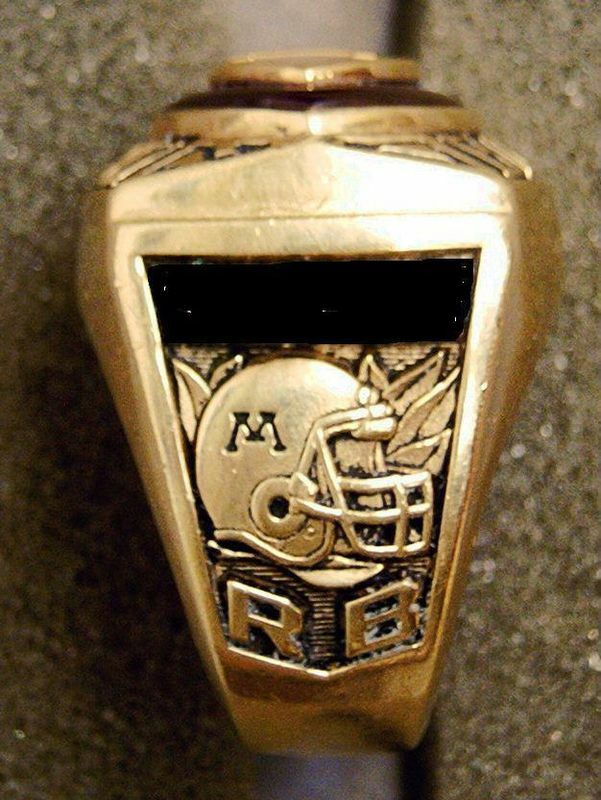 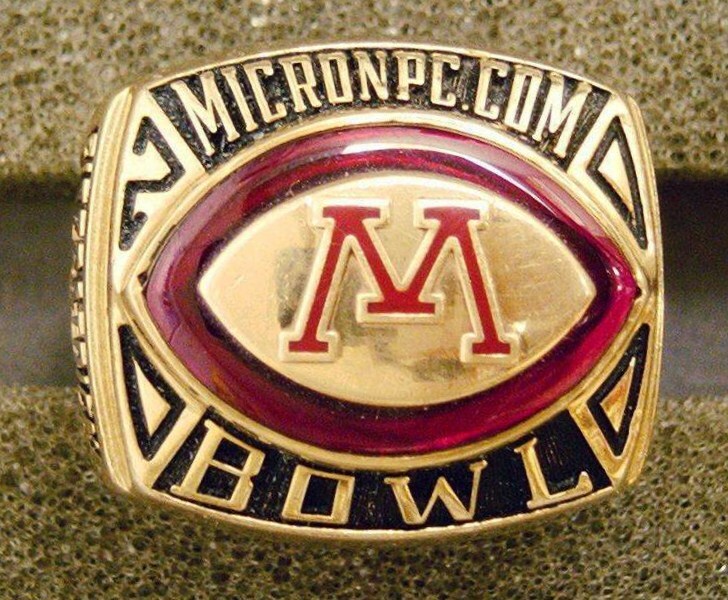 Minnesota Gophers 1999 Sun Bowl player's ring. 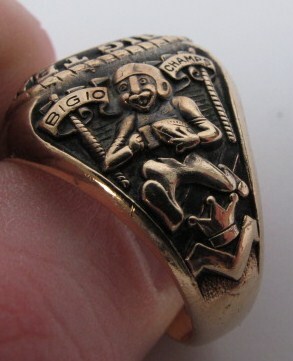 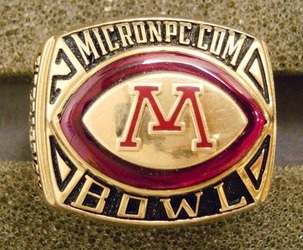 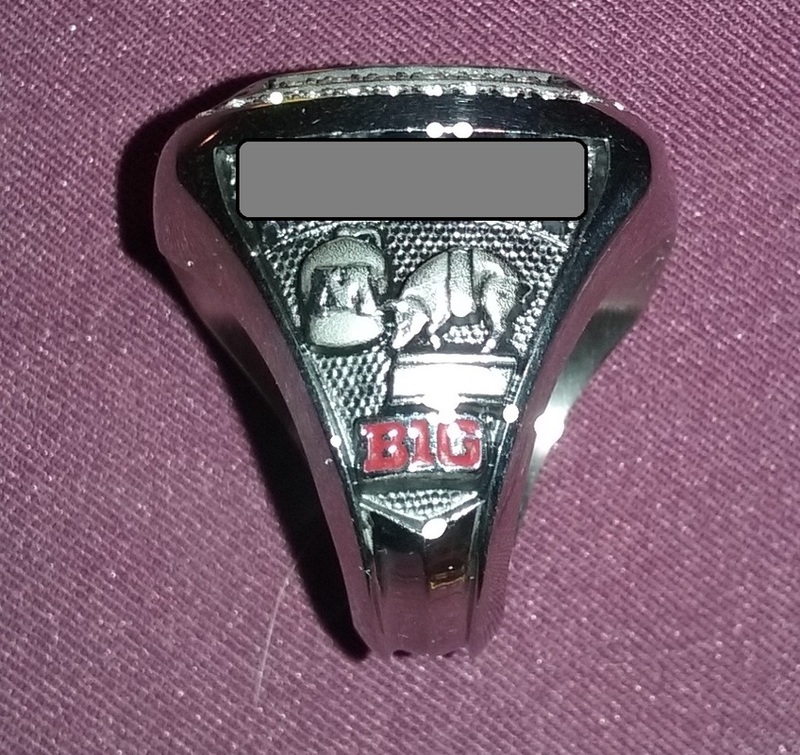 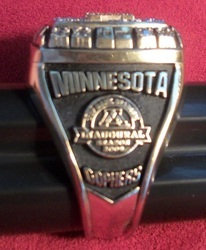 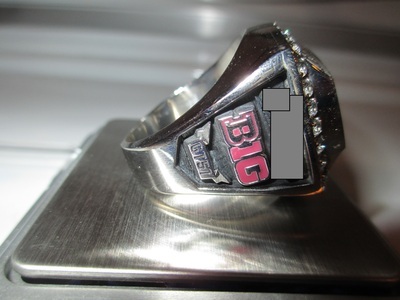 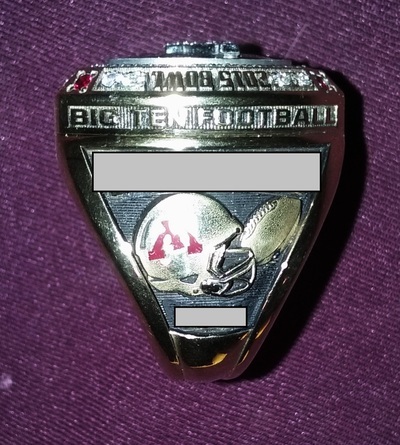 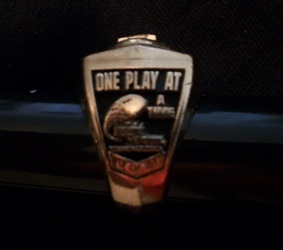 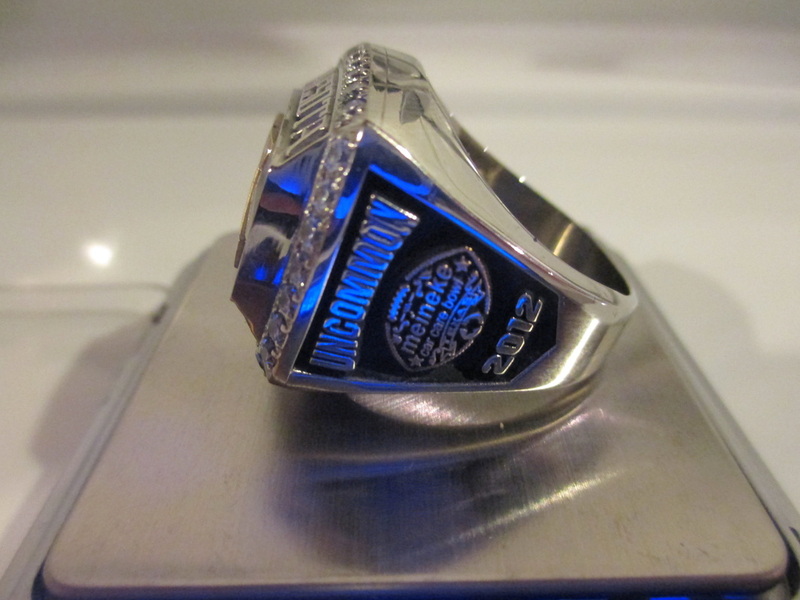 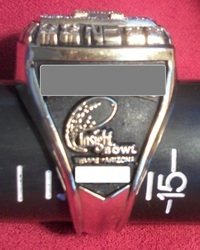 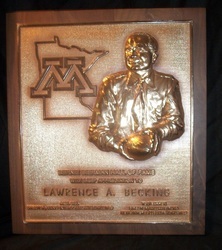 Minnesota Gophers 2000 MicronPC.Com Bowl player's ring. 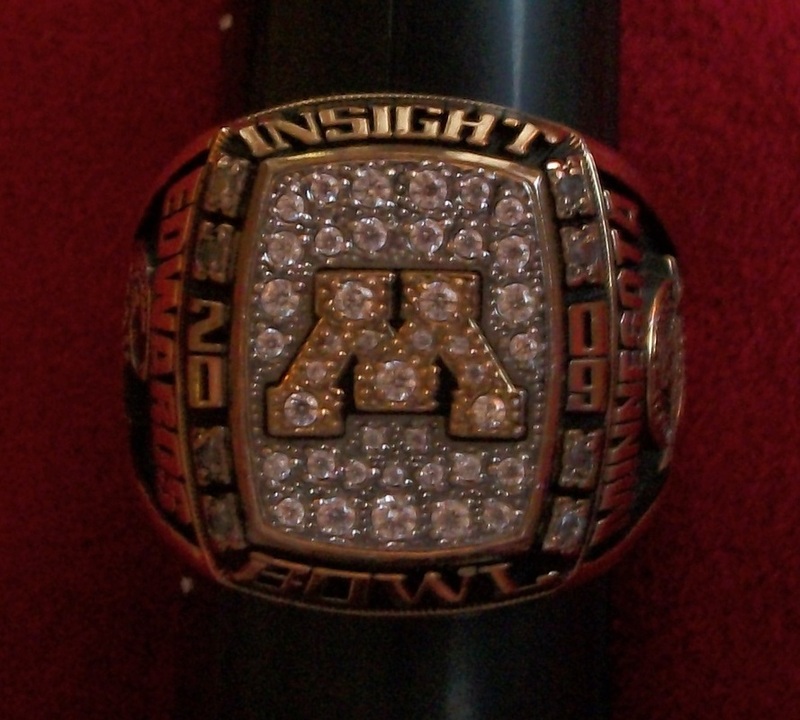 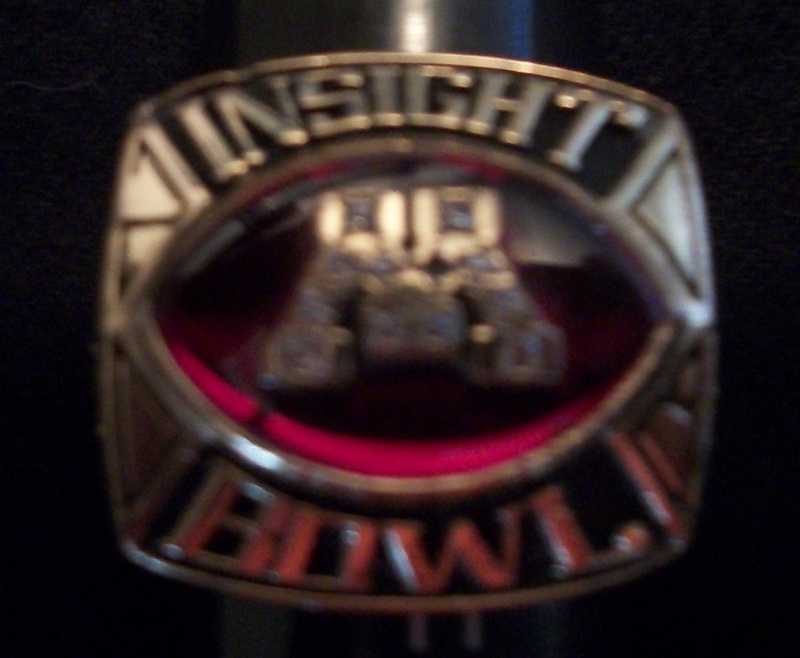 Minnesota Gophers 2006 Insight Bowl player's ring. 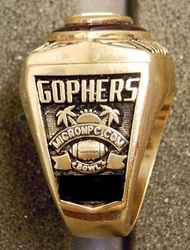 Minnesota Gophers 2008 Insight Bowl player's ring. 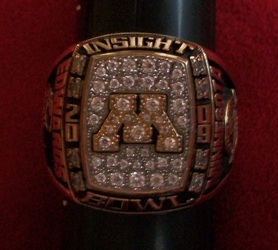 Minnesota Gophers 2009 Insight Bowl player's ring. 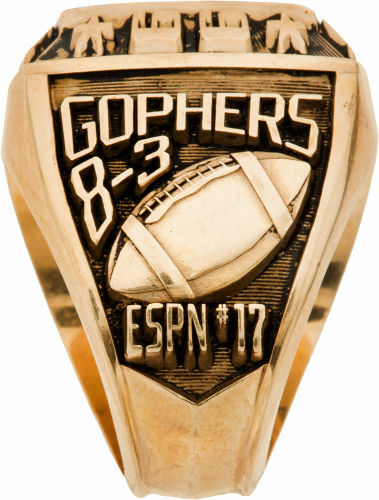 The Gophers lost to Iowa State in this game. 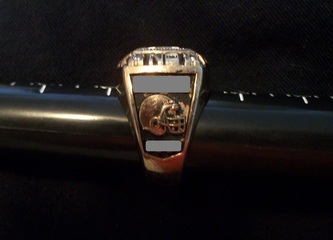 The ring color is actually gold (my flash modified the color). This one is size 15 1/2 and made by Jostens. 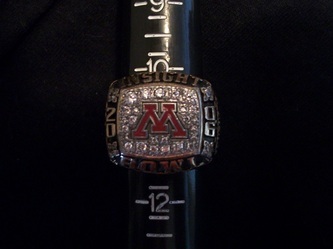 Minnesota Gophers 2012 Meineke Car Care Bowl ring. Minnesota Gophers 2013 Texas Bowl ring. 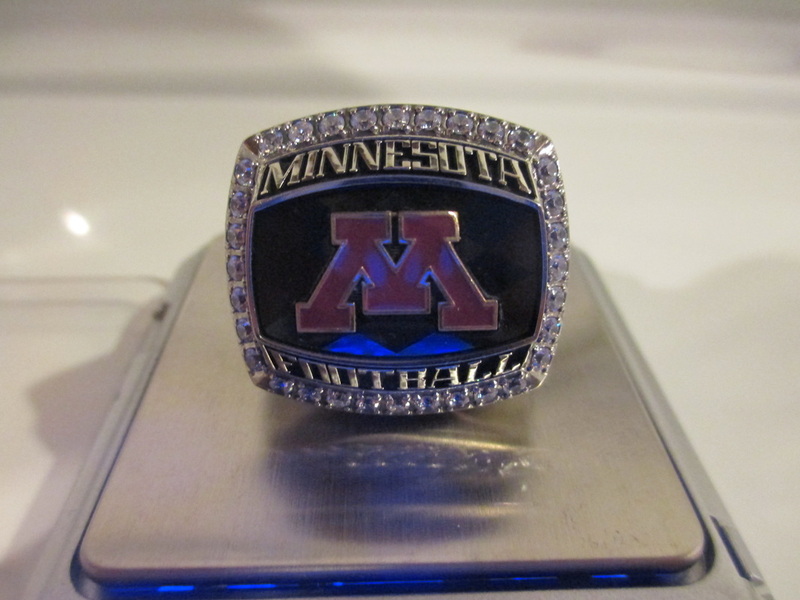 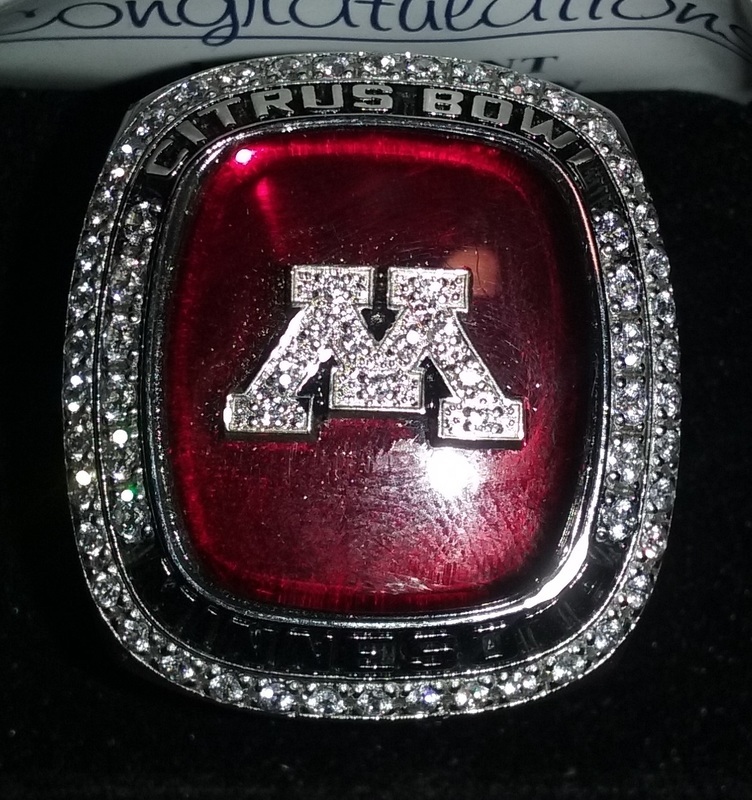 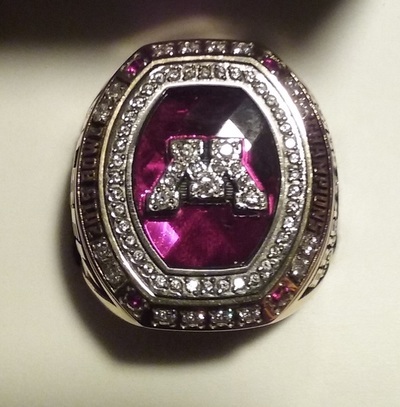 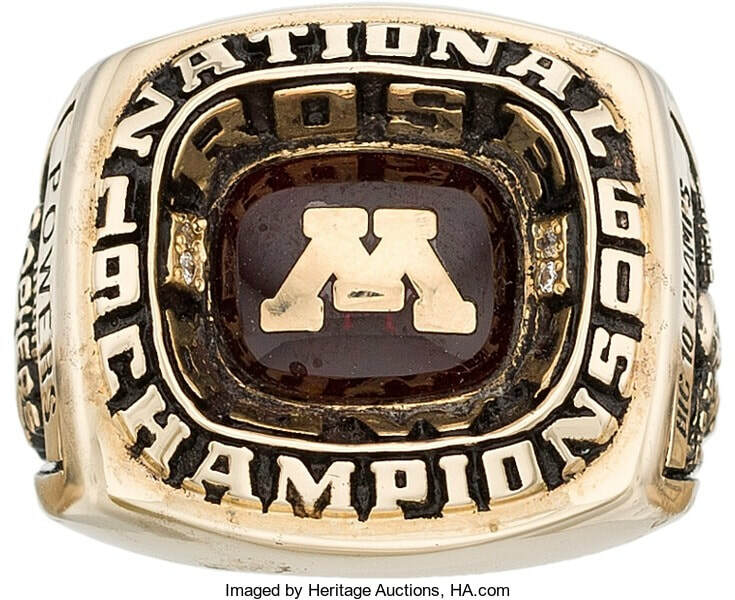 Minnesota Gophers 2015 Citrus Bowl ring. 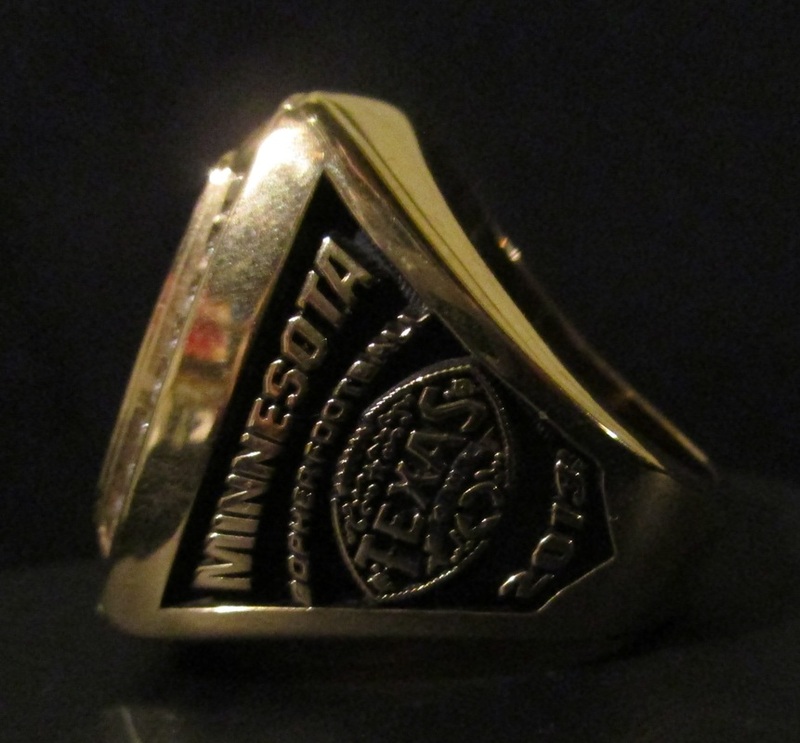 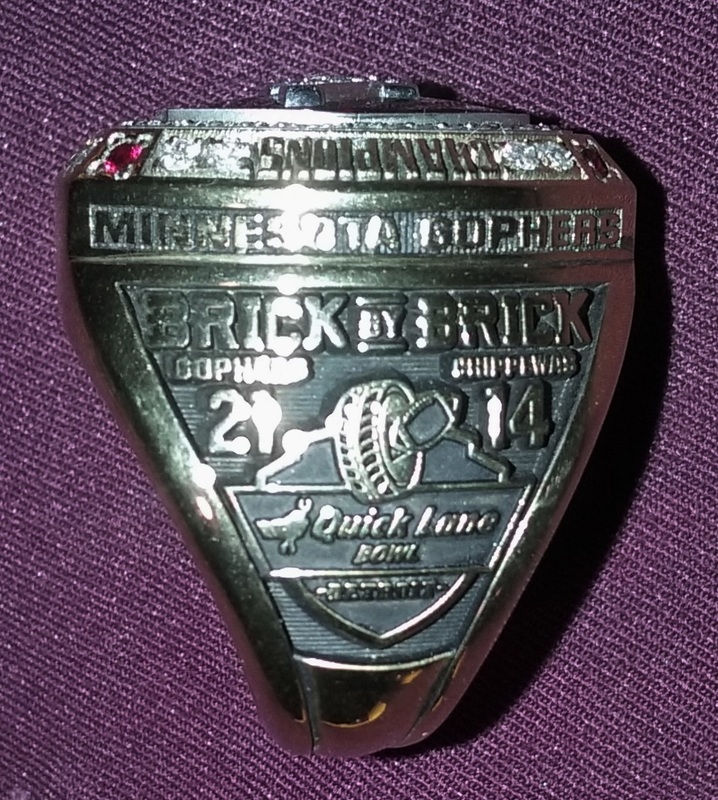 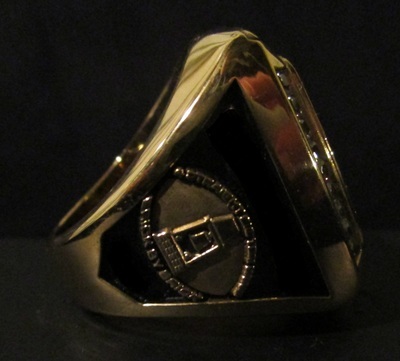 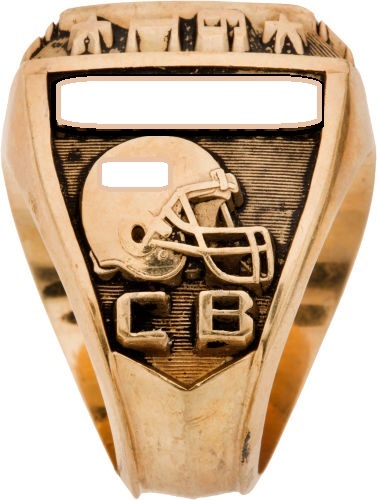 Minnesota Gophers 2015 Quick Lane Bowl ring. 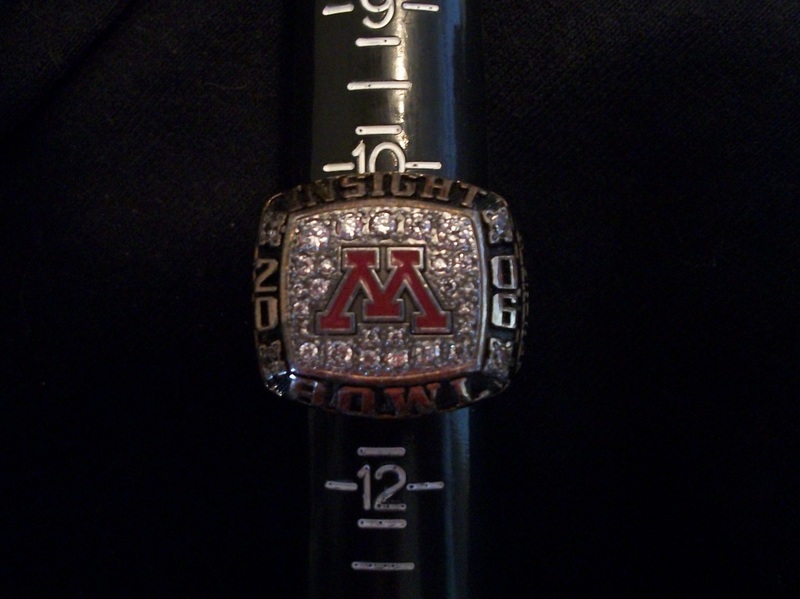 Minnesota Gophers 2012 Meineke Car Care Bowl player's issued belt buckle. 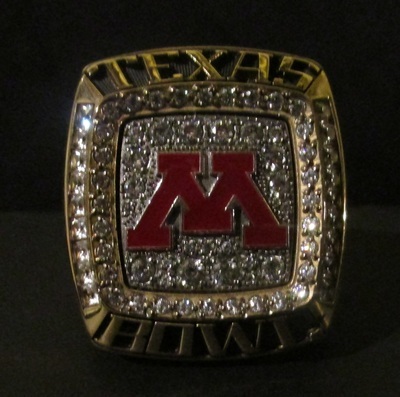 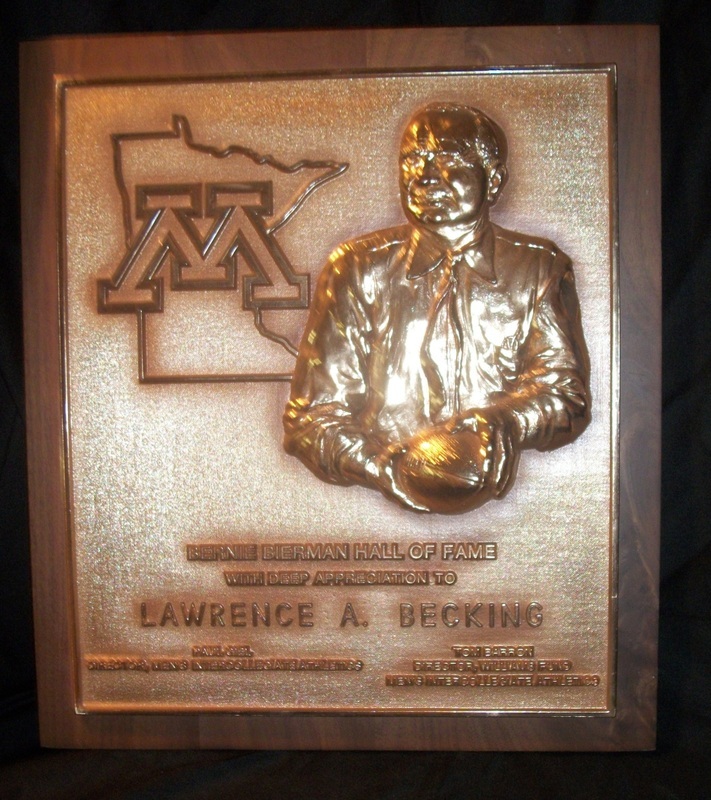 Minnesota Gophers 2013 Texas Bowl player's issued belt buckle. 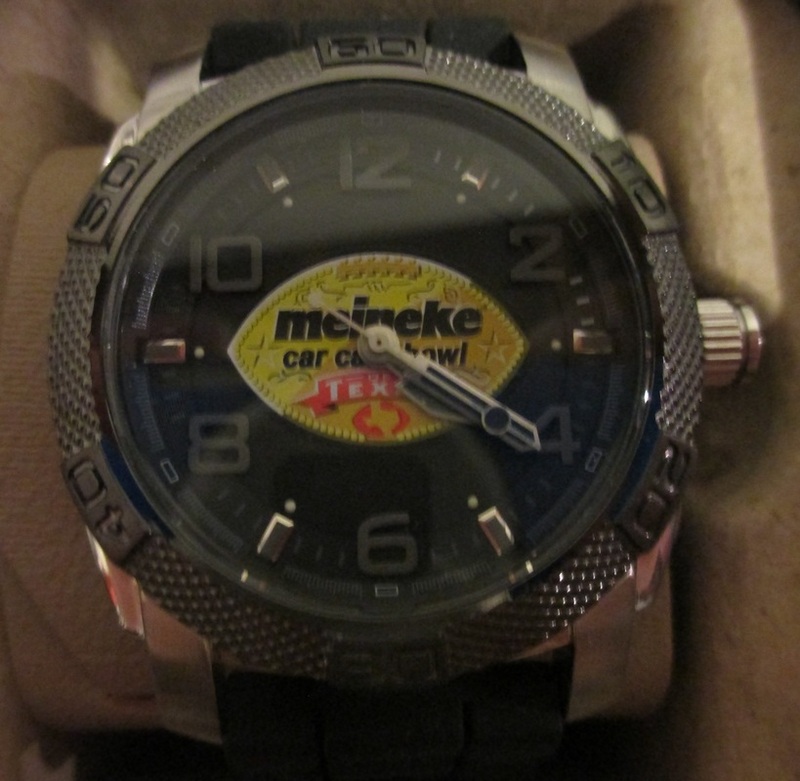 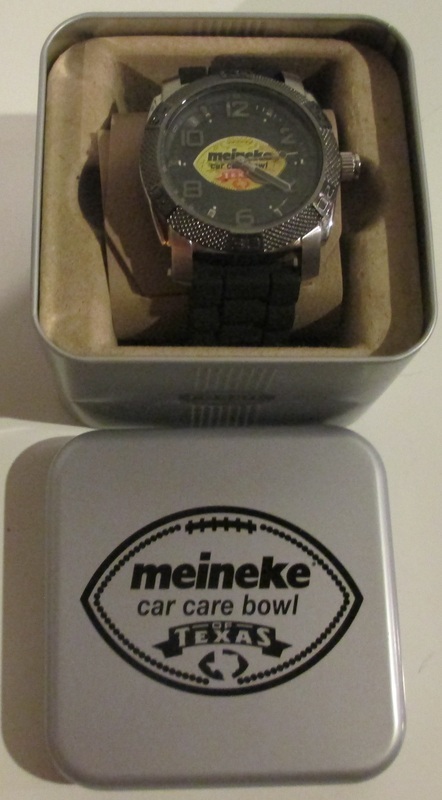 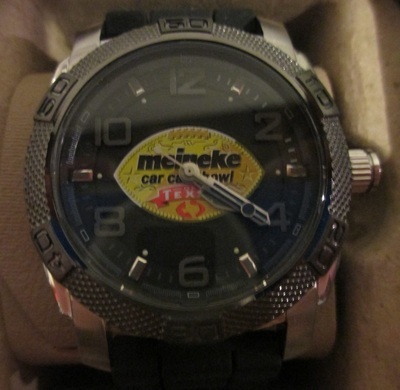 Minnesota Gophers 2012 Meineke Car Care Bowl watch. 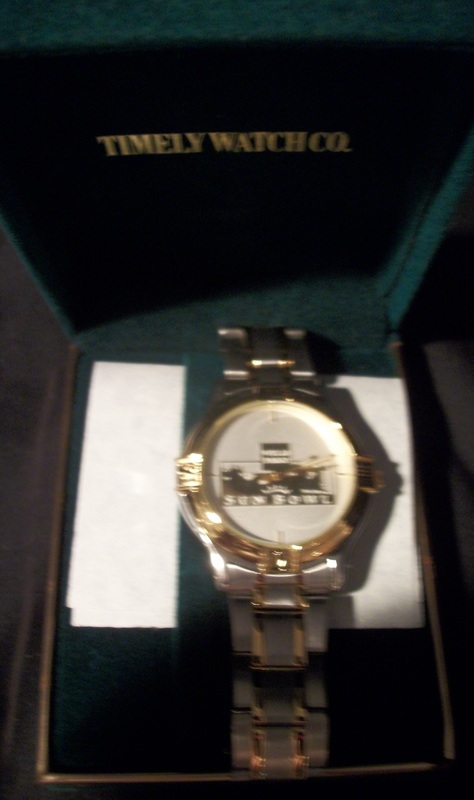 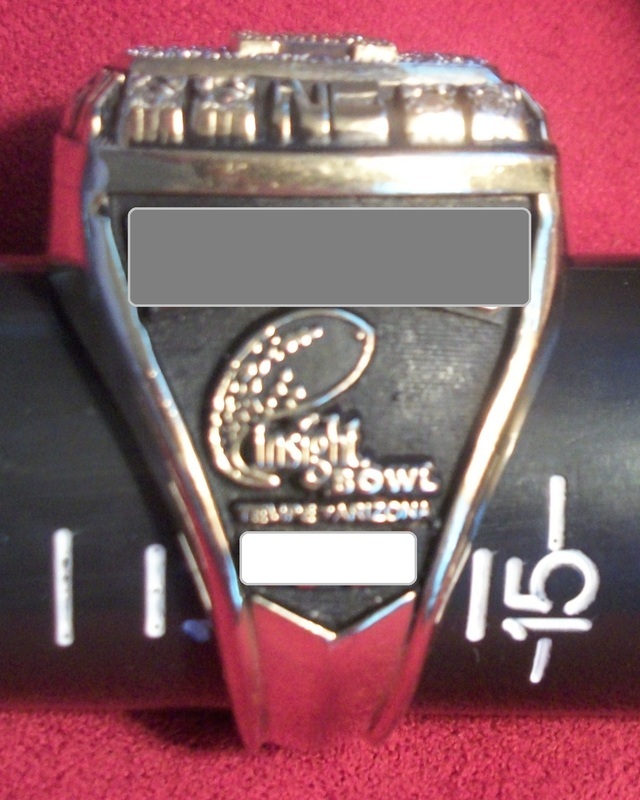 Minnesota Gophers 2003 Sun Bowl watch. 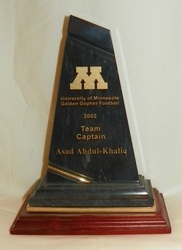 Asad Abdul-Khaliq 2002 team captain trophy. 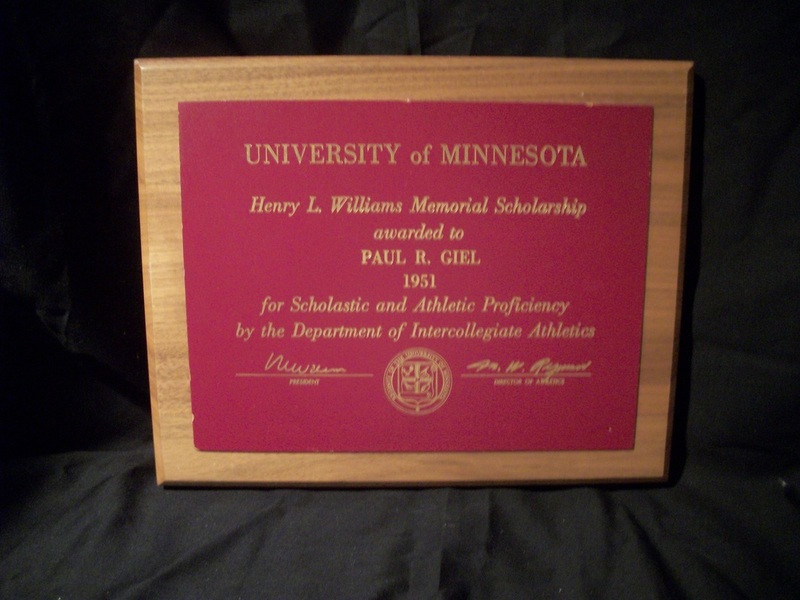 Paul Giel 1951 scholarship award plaque and original team portrait photo. Originally obtained from Giel estate. 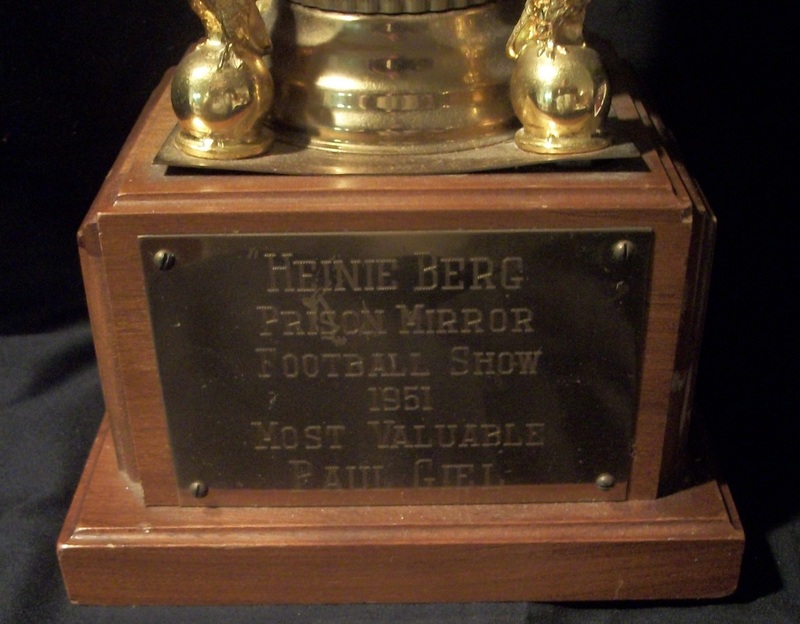 Paul Giel's 1952 Heine Berg Prison Mirror Trophy. 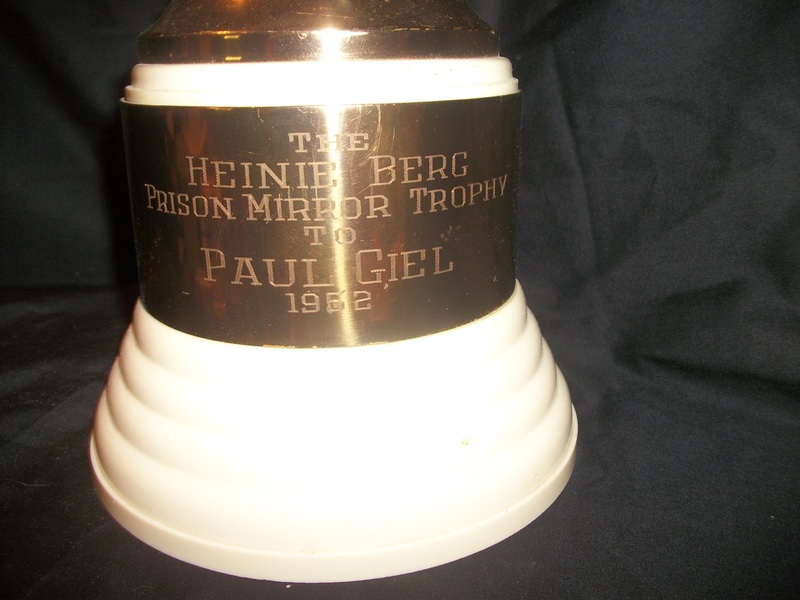 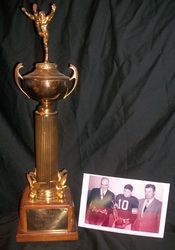 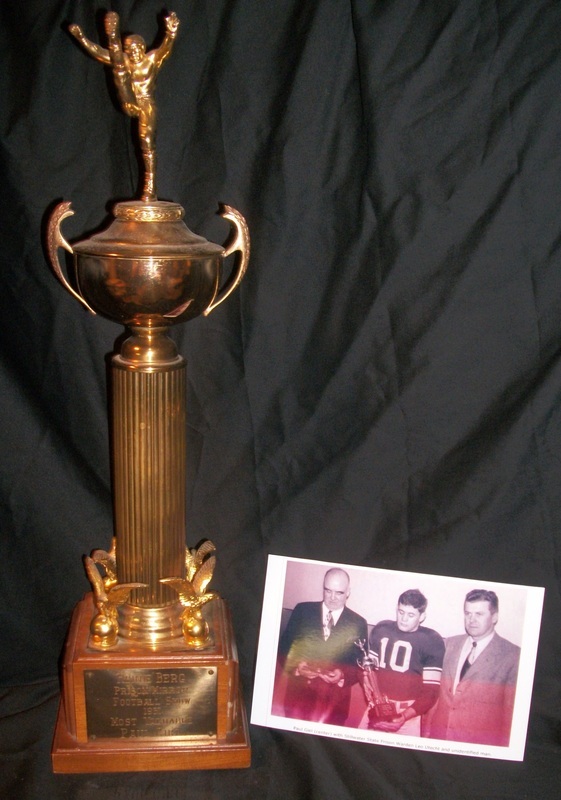 Paul Giel's 1953 Heine Berg Prision Mirror Trophy w/ presentation photo. 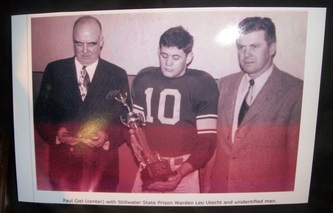 The Prison Mirror is an inmate written and published newspaper based in Stillwater (at the Minnesota Correctional Facility-Stillwater) and the oldest inmate publication in the US. In the trophy presentation photo, Paul is presented the trophy by Warden Leo Utecht and Coach Wes Fesler. 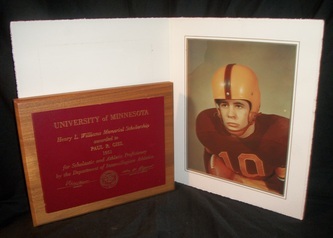 Bernie Bierman Hall of Fame Plaque. This plaque was made when Paul Giel was Athletics Director at the U of M.
Minnesota Gophers game used and team signed ball from the 1936 National Championship season. 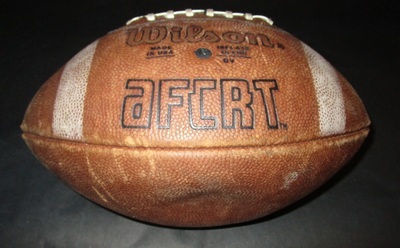 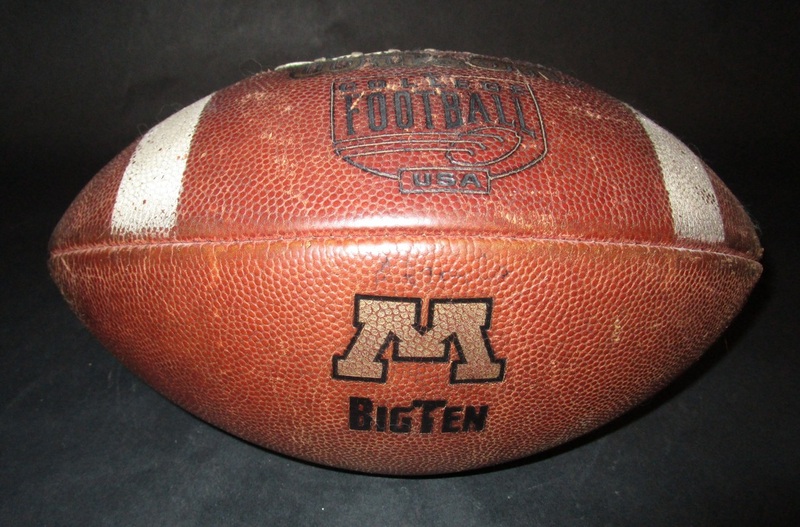 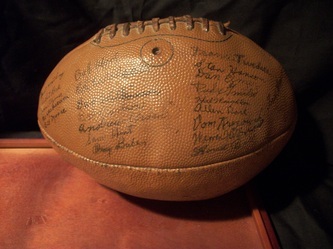 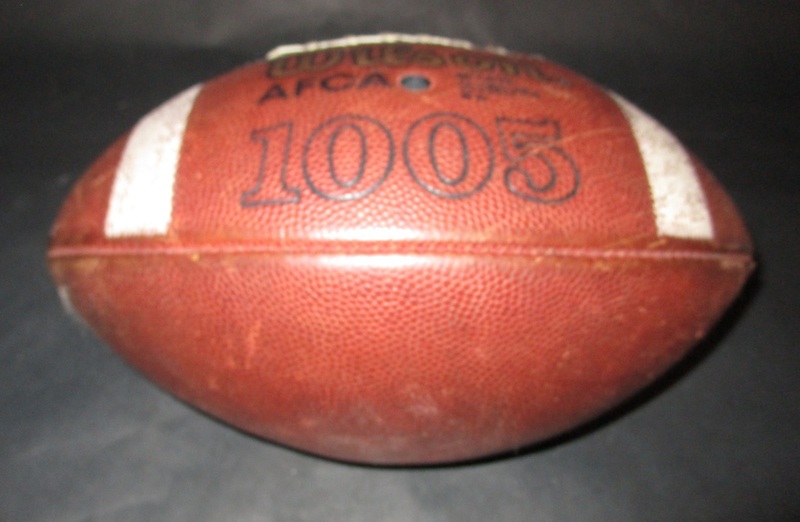 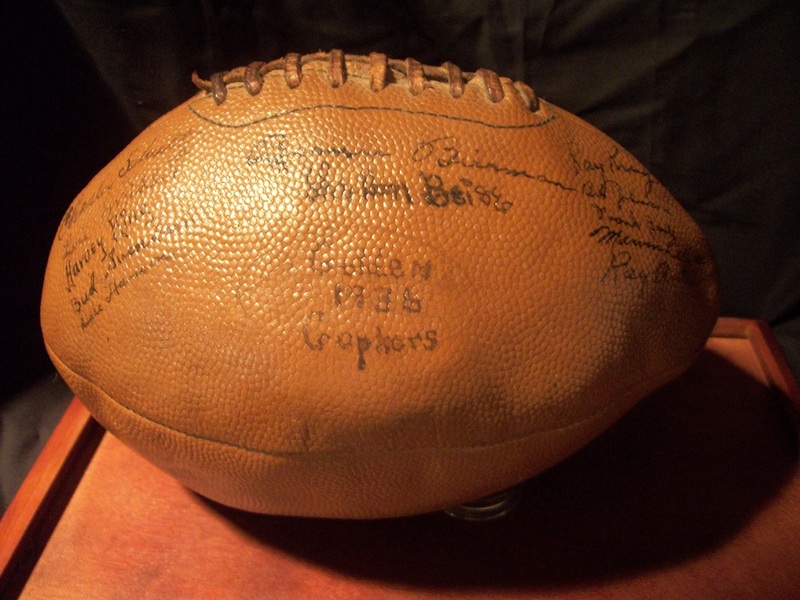 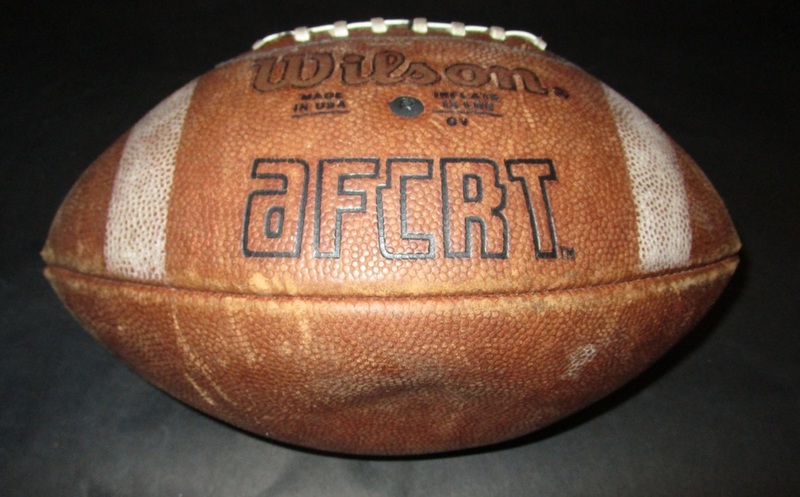 Gophers painted game used ball from the win over Michigan State on October 19th, 1968. 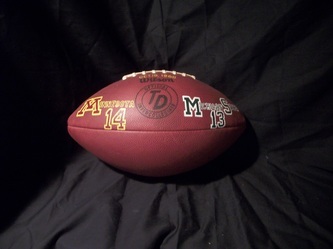 The game was at MSU with the final score, Minnesota 14, Spartans 13. 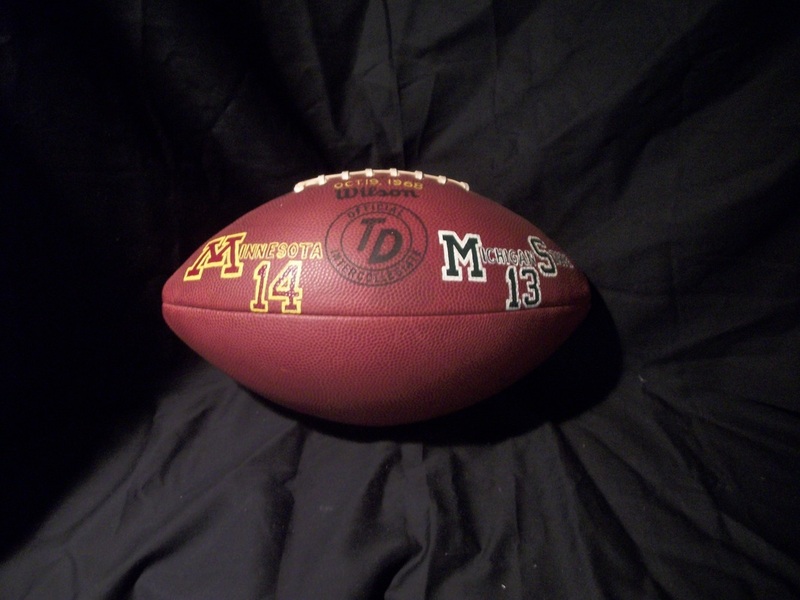 This is a Wilson TD offical ball with Michigan State branded on the reverse of ball. 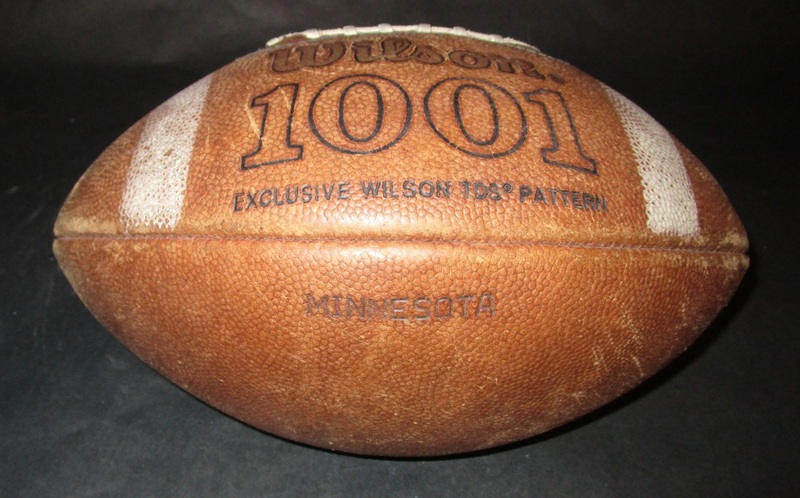 Minnesota Gophers Wilson 1003 model game used football. Minnesota Gophers Wilson 1001 model game used football. 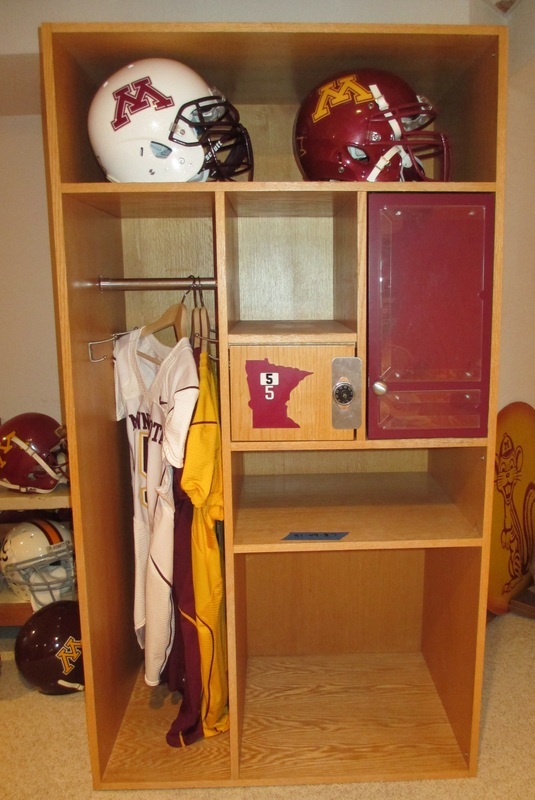 MarQueis Gray's practice facility locker (with his white away game worn jersey inside). 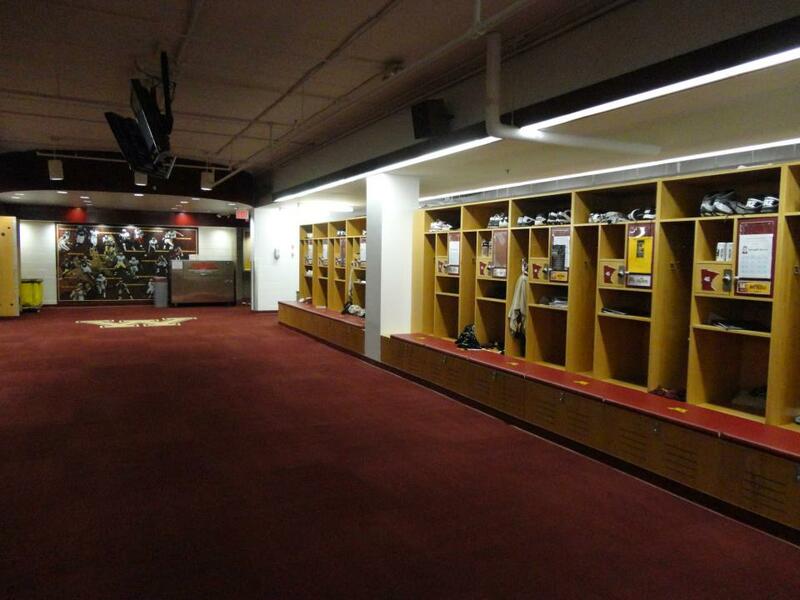 Removed this November, 2012 from the Nagurski/Gibson practice facility as the Gophers updated their locker room w/ brand spanking new lockers. 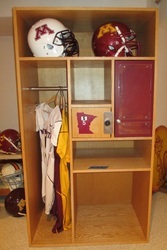 We also have the footlocker/bench that goes with the locker and base the locker sits on (not pictured).